Below are the two daily chart set ups that I use. They do use some of the same indicators but the key differences are the moving averages. The 5/10 method is the fastest moving daily chart that I follow as it uses a 5EMA and a 10MA as the signals for entries and/or exits. The idea is to get one into a trade early to catch as much of the up leg as possible and to also get one out of a trade early to avoid any serious draw down that may occur. The obvious problem with this set up is that it can whipsaw a trader as the fast moving 5EMA will cross up through or down through the 10MA earlier than a slower moving MA’s. The daily chart below is rooted on the late November 2011 lows. It shows how a ‘buy’ signal was generated on $SPX just at the end of November. The 5EMA is the red colored MA and the 10MA is the black colored MA. You can see on the chart that in late November, the 5EMA pushed up above the 10MA in the first part of the ‘buy’ signal. At about the same time, +DI line pushed above the -DI line, the fast moving 5,3,3 Stochastic had a bullish X, and then a couple of days later the slower, 20/20 Stochastic also had a bullish X. The pull back in mid-December allowed for a trend line to be put on the chart, and the trend line remained valid for several months. (A trend line is not actually considered valid until there are three touch points and you can see that the third touch came in early March. But it’s not a perfect world and as long as the stock/index in question is moving above rising MA’s then a trend line with only two touch points can be considered valid until proven otherwise.) 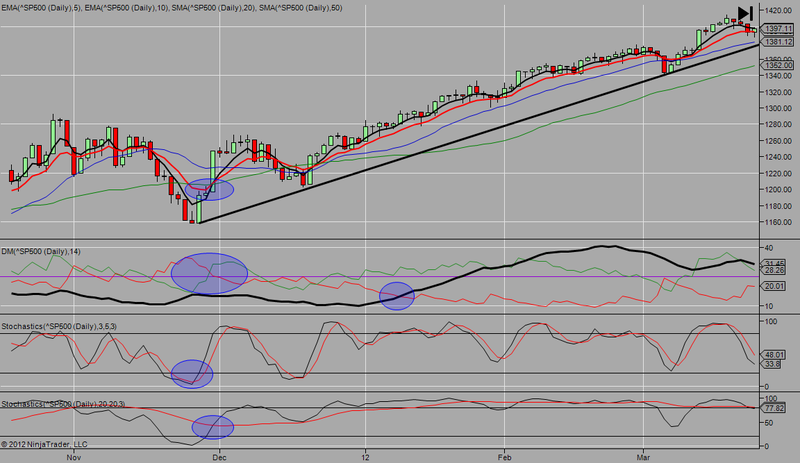 Lastly, in January of 2012, the ADX line pushed up above the -DI line. This is an important occurrence because there are some traders who will wait for this to happen before going long so when this did happen then, in theory, more buyers were drawn into the market. But for every Yin there is a Yang and the chart below shows how a ‘sell’ signal was generated back at the first of April, 2012 with a break of the trend line and bearish crosses of MA’s and indicators. I’ve been using the 9/20 method for several years. It is a more conservative set up than the 5/10 and will get you into a trade a little later than the 5/10 but at the same time you would be more assured that signals generated with this method would be more reliable. I can’t remember who I stole the 5/10 method from, but I stole the basic idea of the 9/20 method from a guy by the name of Basil Chapman. 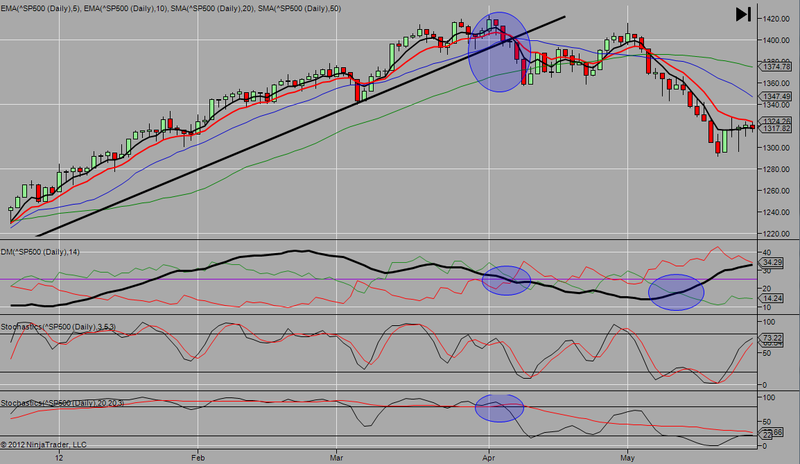 Other important parts of this chart set up are the RSI 14 which dropped below 30 in late May and even while the market would go lower, the RSI 14 would put in a higher low signalling positive divergence with the $SPX. I also use the Aroon Oscillator on this chart as it gives a good signal of an overbought market with readings at 100 and an oversold market with readings in the -100 area. 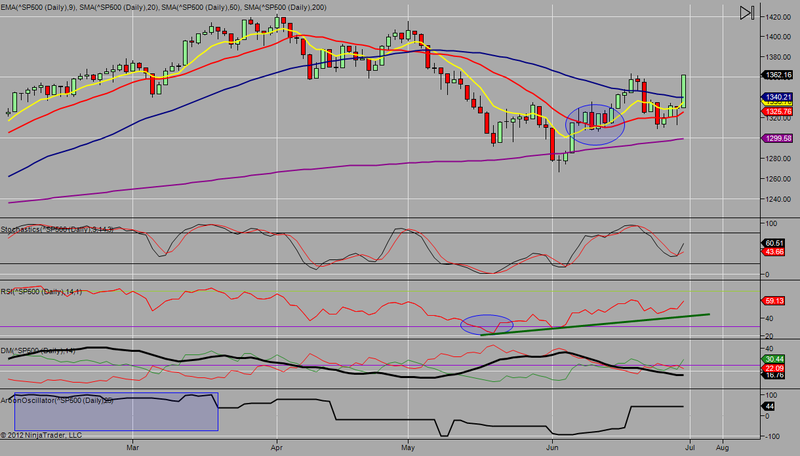 I have highlighted the area from the middle of February to the middle of March when the Aroon Oscillator began to drop. This drop preceded the market correction that began in early April when $SPX was only a few points higher. Also note that the Aroon Oscillator dropped to -100 in the middle of May when $SPX was trading in the 1340 area. This was clearly a false signal, the clues being a falling RSI 14, falling +DI line, a falling stochastic, and steeply declining MA’s. However, in early June, when the Aroon Oscillator dropped to -100 again and then began to rise, it did so in sympathy to the other indicators on the chart. These are, then, the two daily chart set ups and methods that I follow. I watch them both on a daily basis as I find this to be beneficial. Hopefully you’ll find some benefit in these set ups, as well. These charts come from Ninja Trader. If you don’t know, you can download Ninja Trader 7 and use it for free.